This site was home to units of the 149th and 153rd Light Anti-Aircraft Battery, Royal Australian Artillery. According to the war diaries, F troop 149th LAA occupied the site somewhere around August or September 1943. They were relieved by members of B troop 153rd LAA around January 1944. Both units were armed with the 40mm ‘Bofors’ Anti-Aircraft gun and were tasked with defending Coomalie Airfield from low flying enemy aircraft. 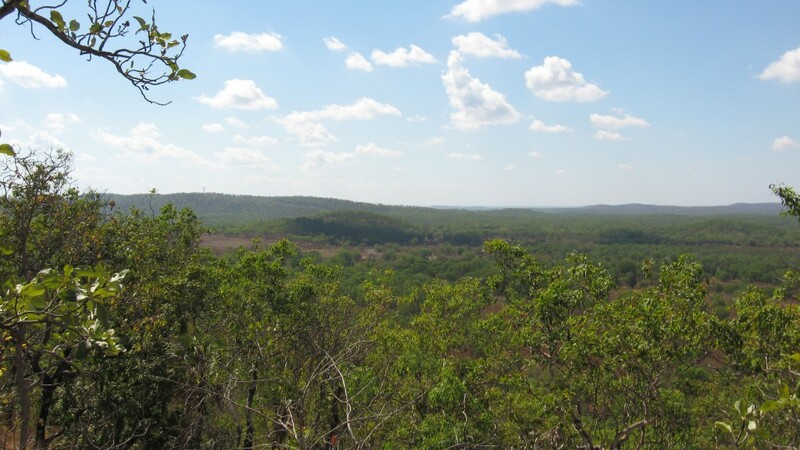 The site sits atop of one of the highest points on the ridge and commands excellent views over Coomalie airstrip to the east. 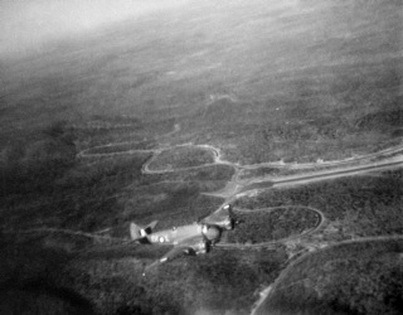 The ground is extremely rocky and it is very hard climbing, but once standing on the top of the ridge it becomes clear that it is an excellent position for an AA weapon as it offers good fields of fire to the North West and to the east the most likely direction of an incoming attack on the airfield. It must have been a difficult task to haul the guns up to the top of the ridge and would have taken considerable effort. Remains at the site include 40mm gun emplacements constructed from rock and star pickets, light machine gun positions, tent foundations, shelters and barbed wire entanglements. Looking South West from northern end of Coomalie Airstrip. Indicated is the location of the AA position. 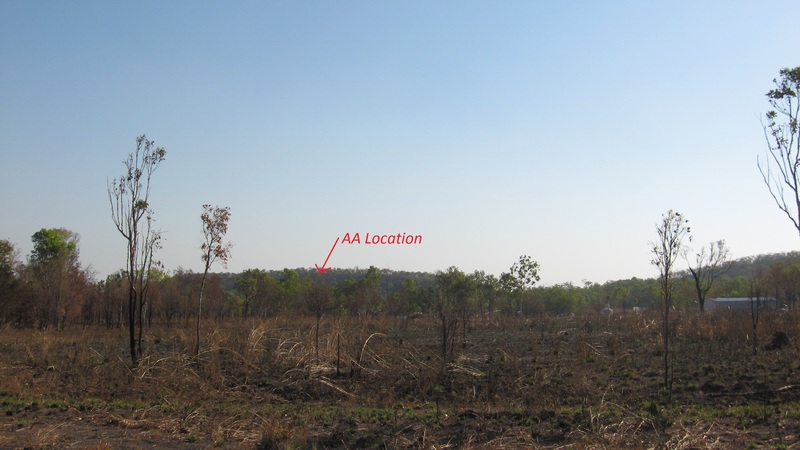 The location of the AA site can just be seen on this photo at the bottom right. View from the AA position looking directly towards where the photo above was taken. The decision to place AA weapons on top of the ridge was probably hastened by the successful Japanese staffing attack on Coomalie in March 1943. The strafing attack which occurred on the 2nd of March, must have given GHQ located at 57 mile an insight to their inadequate defense against low flying aircraft in the area as the A6M’s (Zeke’s) that attacked Coomalie overflew their HQ in broad daylight at 14.30 hours. The attack was also witnessed by members of the 43rd Battalion at 53.5 Mile who stated in their war diaries that units at 51.5 mile, including 3 Brigade HQ were also strafed. The 43rd Battalion had just returned from maneuvers in the ‘west track’ area when the attack commenced. 40mm AA gun emplacement showing the location for one gun. The star pickets would have supported corrugated iron walls and the gun would have been sealed into this position when it was em-placed. Off to the right hand side is the predictor position for the gun. The predictor location running off the side wall of the emplacement. The predictor was probably a Kerrison type and fed target information to the gun. Standard practice meant that the emplacement would have been camouflaged from the air and star pickets to the left and right of the position attest to this fact. You can see the large rectangular gun emplacement and the small circular predictor emplacement clearly in this aerial photograph of another 40mm ‘bofors’ position in the Coomalie area. This emplacement is constructed completely from 44 gallon drums. Soldiers man a 40mm ‘bofors’ at Batchelor, NT in 1943. The size and proportions of the weapon can be gauged in this photo of training in the southern states of Australia. 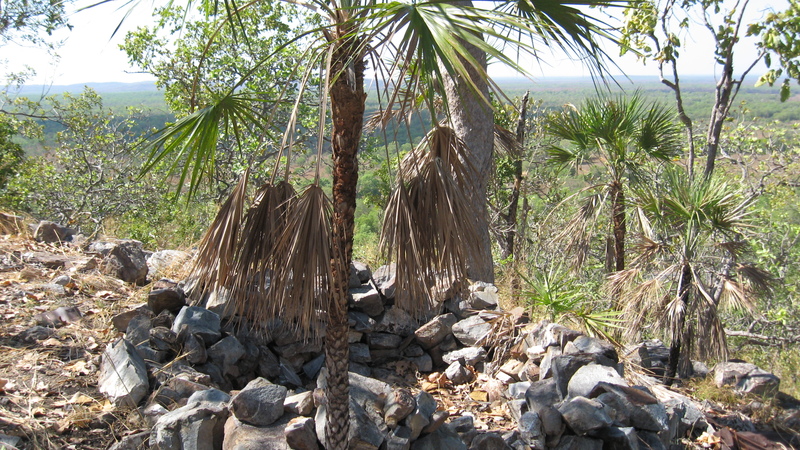 There are many rock circle structures near the main 40mm gun sites and at this time it is not known to any degree of certainty what purpose they served. The structures themselves have decayed in height over the years and it is assumed that these structures where a lot higher. They could either be light machine gun positions or improvised shelter positions to protect the soldiers form bomb fragments and machine gun fire. Rock circle, possible an AA position which would have contained a Bren or Lewis Gun. Same type of structure facing east and constructed from 44 gallon drums and rock.